Oil and gas companies fracking in the Fox Creek area will be first to operate under new rules requiring plans for an entire region, not individual wells, says the Alberta Energy Regulator. 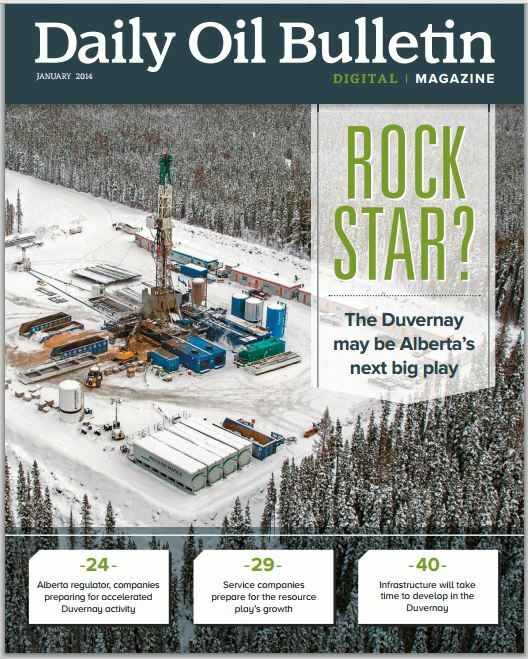 The Duvernay shale reservoir west of Whitecourt was chosen as a pilot project for new “play-based” approval process which aims to reduce the industry footprint of pipelines and roads on the landscape says Cal Hill, AER vice-president of the strategy and regulatory division. Under play-based regulations, companies have to get together and produce an overall plan for a region demonstrating collaboration on roads, pipelines and water usage. The AER will look for a single application for projects by several companies, said Hill. The current approach — approving each company’s applications separately — makes it difficult to reduce the cumulative environmental impacts of the additional roads and pipelines required by each new project. Area landowners and communities will benefit from a regional approach because “they can get a sense of the full scope of development and have earlier input,” said Hill. The regulator is keen to move quickly as shale play in west central Alberta is about to take off, he added. Extracting oil and gas out of shale requires many more wells, more pipes and much more water usage than conventional oil production and that impact needs to be managed better. “It’s a very competitive industry and we have to figure out how can we incent and encourage collaboration,” he added. Hill said the goal of the new approach is to resolve issues earlier and therefore reduce the need for public hearings. “There still has to be ample opportunity for people to have a say,” he said. “The fracturing techniques used for early exploration in this area are larger scale, says Willard, adding that, as such, the amount of water used for an individual well is probably the highest in this area of the province. For example, outside the City of Calgary in the Cochrane-Lochend area, operators use about 1,000-2,000 cubic metres of water when performing a slick-water fracture of a tight Viking horizontal well, whereas in the North Duvernay it might require 50,000 cubic metres of water per horizontal well, he says. Under the project, the AER will be accepting single applications for energy development which may include many activities governed by different pieces of legislation. The chopper, owned by Gemini Helicopters of Grande Prairie, was monitoring well sites when it went down on Jan. 27, 2013, in a wooded area near Fox Creek, about 260 kilometres northwest of Edmonton. The board said the pilot had been with the company for nearly two years but hadn’t been following proper procedures before the crash. He didn’t file a flight plan that day and hadn’t filed itineraries on several other flights that week. The night before, he drank three or four beers at a work camp. The day of the crash, he visited several oil sites then landed — after three approaches — at one site’s security gate. He flew off with an unauthorized passenger and spent 48 minutes at a remote cabin, where investigators later found an empty wine bottle and liquor bottle. The pilot then dropped his only passenger back at the same security gate, before flying off erratically. He crashed five minutes later. Nikiforuk: What’s Missing from Canada’s Academic Fracking Debate? “The Gritty Truth.” Qu’est-ce qui manque dans le débat sur la fracturation hydraulique au Canada? Cal Hill, executive manager of the Regulatory Development Branch of the Energy Resources Conservation Board (ERCB, now AER) said his agency is now actively investigating four (the ERCB later corrected that figure to five) well blow-outs caused by horizontal multi-stage hydraulic fracking…. The Alberta regulator did not announce an investigation until a January 2011 fracturing incident made global headlines. That remarkable event sent oil and fluid spurting out of an existing well 1.2 km away from the oil shale well being fractured near Innisfail, Alberta…. “Nothing specific” has been set aside for additional monitoring admitted Hill.